Sullivan's Roto Fluffer Brush [ROTOFLU] : Highland Livestock Supply, Ltd, Products for all of your show animals! This new twist on the traditional roto brush will take your hair presentation to a whole new level, with its tremendous ability to separate and lift the hair creating a full body look it will become your show day go to tool. Built into a durable aluminum housing sets two styles of bristles. 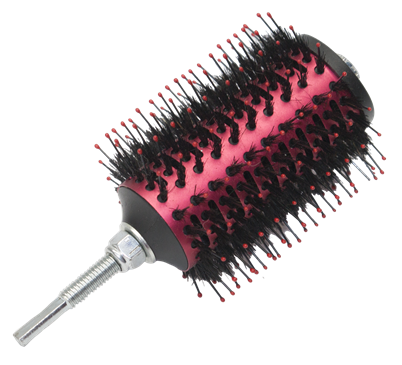 The first being 3/4" soft flex bristles made for ultimate separation and lift to thick coats. The second being 1/4" fiber bristles to provide superb undercoat separation. Combining these two bristles provide hair volume like no other that works on all types of hair coats to provide an even fluff without making the hair wavy. The Roto Fluffer is best used for clipping, fitting, displaying and show day preparation.